Once upon a time I went to a show and it was called D.O.A. It was from the script by Russell Rouse and Clarence Greene and it was adapted and directed by Elizabeth Lovelady. It was about this man named Bigelow (Mickey O'Sullivan) and he had just gone on vacation to San Francisco. While he was there he was poisoned and told that he only had a few hours to live. And he spends those hours trying to find out who poisoned him. 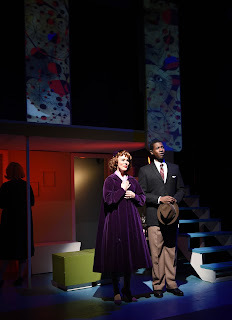 And he talks to his girlfriend/secretary Paula (Megan Skord) and tries to make up to her. It was about redemption, revenge, and determination. I found it super mysterious and cool and very exciting. I really liked this show. The show was performed in a very small space, which I think made the show even cooler because you felt like you were right there in the scenes. All the set (Mike Mroch), costumes (Raquel Adorno), and props (Jamie Karas) were all in black and white. Most of the lighting (John Kelly) was very dark too. It made it more mysterious and feel more threatening. It also made it seem like a noir, black and white movie. It was like watching an old movie brought to life. I thought the makeup was super cool. I liked how it was black and white too. I also liked how people's faces were the only bit of color in the whole show. It was a cool contrast to have everything black and white and the skin color was the only kind of color that there was because it put together stylization and humanity. I loved all the fights (by R&D Choreography). I felt so involved in the experience that when someone got out a gun, I was worried I would be shot myself. My favorite fight was the one where Bigelow and Chester (Sean McGill) were using flashlights so you would only see a part of the fight and then another flash of the fight and then darkness. It was super creepy, but I really loved it. I also really liked the fight between Paula, Mrs. Phillips (Carol Ludwick), and Ms. Foster (Kelsey Shipley). It really showed a lot of girl power and it was really action-packed and cool. Even though it wasn't a very long fight, it was really cool and I really liked it. Paula and Ms. Foster were two of my favorite characters. They were super powerful and both of them were pretty clever. I think that Ms. Foster's planning was a little bit better, but then Paula foiled her plan and they had an awesome fight. I also thought it was really cool that they had Ms. Foster and Mrs. Phillips be in love with each other. I thought that was a really awesome update from the older story. I thought that Bigelow had a lot of flaws, but he was still a cool character. He seemed to really like his girlfriend, but he didn't tell her truth, and I don't understand why he would do something like that if he really loved his girlfriend. 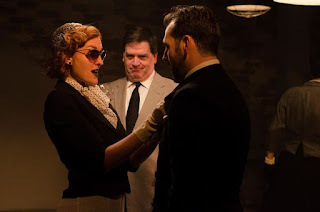 People who would like this show are people who like noir, badass women, and flashlight fights. I think people should definitely go see this show. It was a really awesome and exciting experience, and I really loved seeing this show. Once upon a time I went to a show and it was called Ride. It was by Neil Connelly and it was directed by John Ross Wilson. It was about this person named Quill (Rose Freeman) and Quill's friend and business partner has just died in a biking accident. They had owned a bike shop together and Quill started running it without him. But his brother Danny (Todd Wojcik) and sister Molly (Annie Prichard) think they have inherited it and think they can sell it. But Quill thinks she still owns it. It is about friendship, letting people go, and rights. I thought this was a really interesting show. It made me think a lot about losing people and how you can feel like they put you in a bad position even though they couldn't have done anything about it. I thought the set (by Wilson) was very interesting and cool. It looked like a real bike shop. The seating was arranged really cool because some of the seats were right on the set, so you could feel like you were in the show. Another thing I really liked about the set was how they left the messes which showed you a lot about Quill, that she doesn't really clean up and she doesn't care if she leaves a clementine on the floor for days. I thought that was a cool touch to the entire feel of the set. Riley (Alex Dauphin) and Quill were my favorite characters. You could see a big connection between them and you could see a lot about the relationship, like how Riley felt responsible for Quill, even though Quill had taken care of herself for a long time. Quill didn't really know how much Riley cared about her. Even though Quill didn't like fruits and vegetables, Riley would still bring them, but Quill didn't know Riley was doing it for Quill's own good. She knew she didn't like it and thought Riley might just be doing it to torture her or something. Riley is a person who tries to have it all together and tries to help with other people's lives. Quill doesn't really care what people think. She doesn't care about cleanliness and she would much rather eat Twinkies all day than eat one baby carrot. Riley was mad at herself because she felt like it was all her fault that her boyfriend died. And Quill is mad at herself because she feels like she can't keep her best friend's and her dream of owning a bike shop alive. The people who worked at the bike shop and lived around it were very different from Molly and Danny. You could really tell because one of the siblings changes to be more like the people that work in the bike shop and actually starts to work in the bike shop. How much he changes really shows you the differences in the cultures. 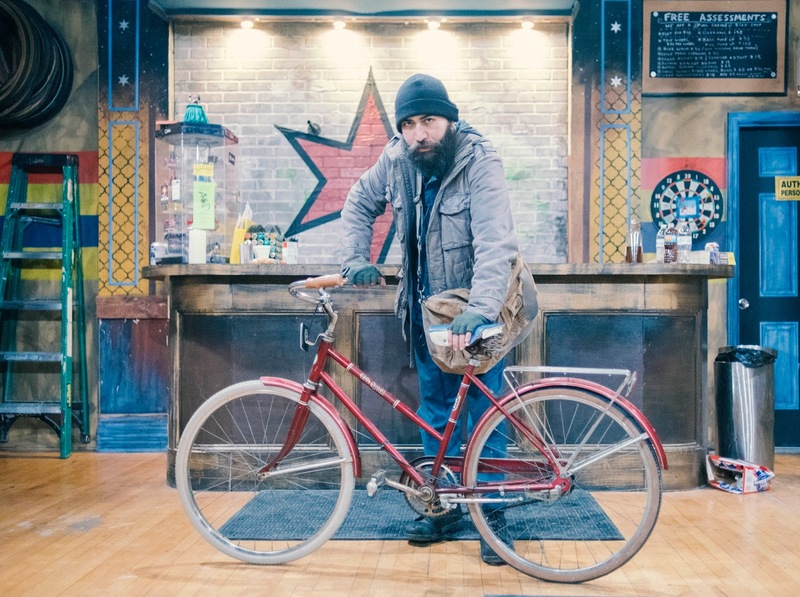 Dell (Abe Elmourabit) neither worked in the bike shop nor was rich. 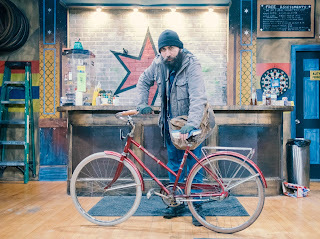 He was a friend of everyone in the bike shop, but he didn't have a home. He sold different things that people had thrown away. He seemed like a really nice person, but all Molly and Danny see at first is a homeless person. The bike shop people interact with him like a friend, not like he is gross. 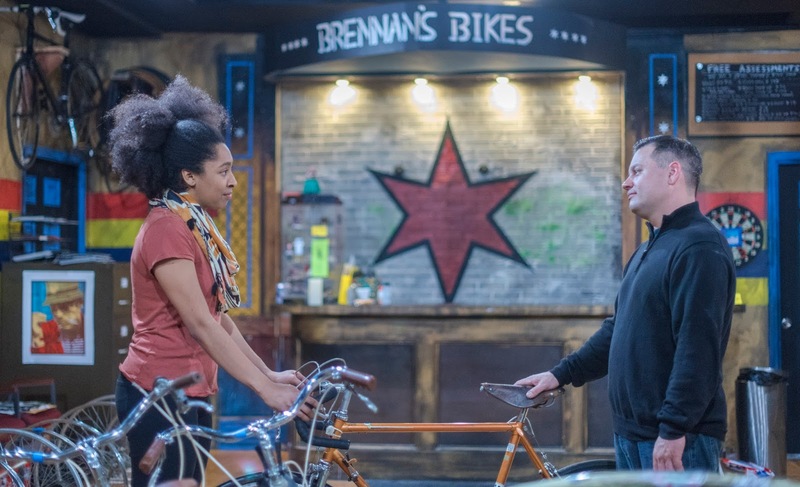 I think the play thinks bike shop culture is better than rich people culture because they make one of the rich people mean the entire time, kind of like the villain. And the other person is turned into a bike shop person. I think it is saying "This is my culture, this is what I believe in." But it is not saying that rich people are always bad. People who would like this show are people who like bikes, Twinkies, and learning about different cultures. I think people should go see this show. 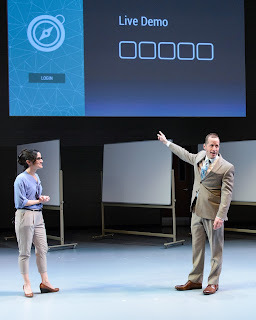 I thought it was very compelling, and it was especially good for a brand new theater company. Once upon a time I went to a show and it was called Short Shakespeare! 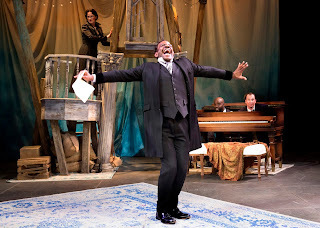 Twelfth Night. It was by William Shakespeare and it was adapted and directed by Kirsten Kelly. It was about This girl named Viola (Rebecca Hurd) who had been shipwrecked and thought that her brother Sebastian (Nate Santana) was dead, so she decided to dress up as a boy, change her name to Cesario, and serve Illyria's Duke, Orsino (Neal Moeller). But she falls in love with the Duke who is in love with the Countess Olivia (Krystel Lucas). And when Viola is going to tell Olivia of the Duke's love, Olivia falls in love with Cesario. 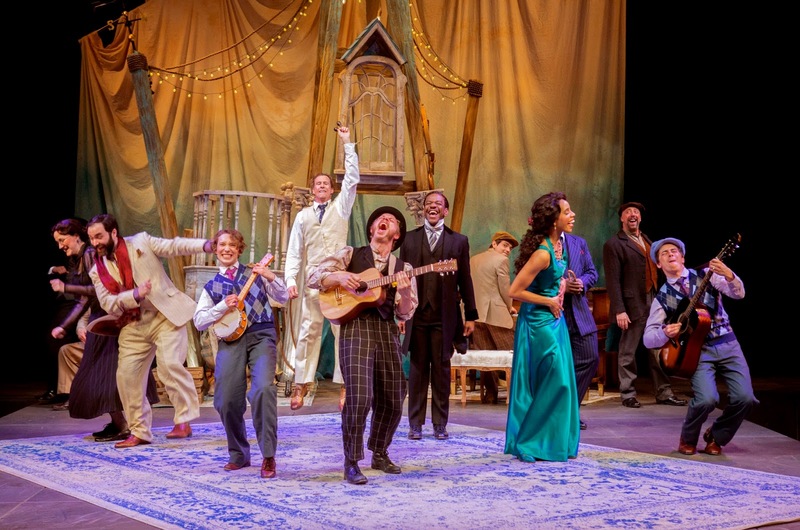 And of course there are many antics by Olivia's servants, Malvolio (La Shawn Banks), Maria (Lydia Berger Gray), Fabian (Donovan Diaz), and Feste (Will Mobley), and by her Uncle Sir Toby Belch (Ronald Conner) and his friend Sir Andrew Aguecheek (Dominic Conti). I thought that this was a really great and funny show. 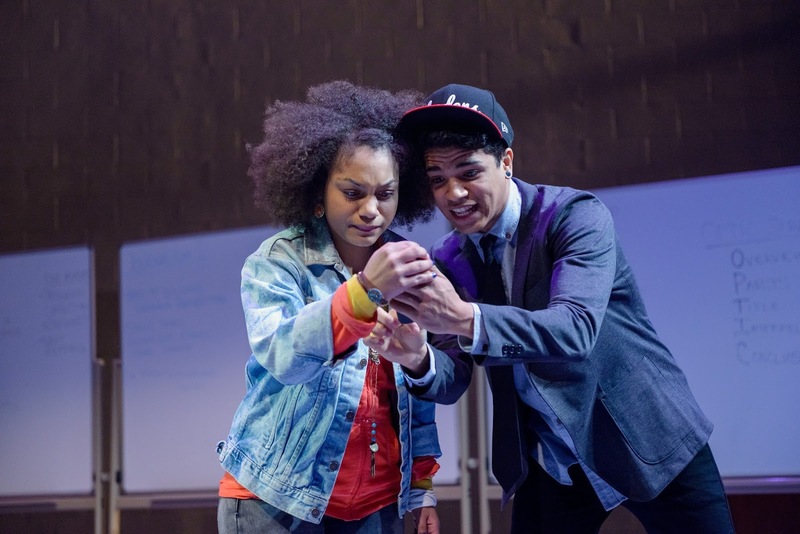 It felt like a very modernized and relatable version of Twelfth Night. I found it really fun and funny and I really loved it. Usually the best part of Twelfth Night, in my opinion, is the elaborate prank that they play on Malvolio. I felt this part of the show exceeded my expectation. All of the actors were just too funny and whenever Malvolio was on stage, I would just start laughing hysterically. I found him so hilarious. Sometimes you hate Malvolio and think he deserves what he gets, but in this case I felt very sorry for him. He wants to have some power, which isn't wrong. Feeling powerless isn't a good thing to feel. I think he thinks he deserves more power because he works so hard, but that makes him vulnerable to the prank because he thinks "This time has been coming for so long." When Malvolio thinks that he has found out that Olivia has feelings for him, he sings and dances out of the room and he is squealing and it made me feel happy and sad for him, because I know what is coming. That usually isn't his character; his character is usually very serious and forbids any kind of fun from happening. And suddenly he is having the time of his life! I don't have much sympathy for the people playing the prank on him. He was just trying to get some order in the place. They are right that he would have more fun if he relaxed, but they didn't have to pretend he was put in an insane asylum. Eventually they do realize they've gone too far. 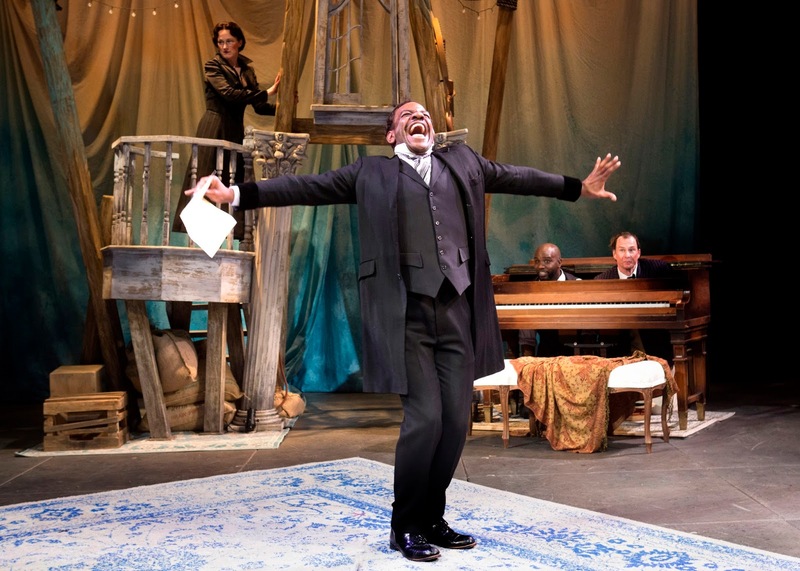 I thought that it was hilarious when they were all hiding out in the piano and Malvolio was so overcome with love that he didn't even notice Sir Toby Belch planking on the piano bench! Viola was a very relatable character for me because she had very excitable and overreacting moments. Like I found her facial expressions when Orsino put his head on her lap very funny and I could relate to it. When someone you have a crush on holds your hand, you kind of have a moment of "Oh my gosh. I can't believe this is happening!" I liked that this Viola seemed pretty comfortable being a boy because I am not a huge fan of when actors playing Viola are kind of shaky and their Viola keeps forgetting that she's pretending to be a boy. The actor found the funny parts of Viola without having to forget and then realize. She acted like a boy except when she was alone and then she would swap. I loved how she would just take any signs of friendship, like entrusting her with a secret, from Orsino into signs of love and turn little things into big things. And the way she interacted with Olivia was that she just tried to convince her that Cesario wasn't as great as Olivia thought he was. I also thought Olivia was hilarious but not in the same way. She also interpreted anything as signs of love but she was also a lot more sassy than Viola which was another reason I love Olivia so much. And I feel like the actress portrayed the character spot on, with a lot of sass but also a little bit of a sweet side. She is not exactly mean, she is more trying to keep her life normal. I've seen a lot of Olivias that are pretty haughty, but this one wasn't as haughty. So you didn't wonder so much, "Why does everyone like Olivia so much?" I feel like Sebastian is sometimes thought of as a thankless role. The character doesn't have a lot to do and you don't get to know much about him. I felt like Sebastian in this production, though, made me pay attention to how he felt and not just think of him as the brother of Viola. He put depth into his lines and even though he didn't have a lot of time on stage you could see that he felt close to Viola and was sad about her supposed death, but I think he was trying to get over it because he knew Viola wouldn't want him to be depressed and not marry anyone for seven years like Olivia. Antonio (Lynn Robert Berg), who rescues Sebastian from his watery grave, is always a very very small role and I thought this adaptation gave him even less to work with than the original uncut play. My favorite versions of Antonio shows he has affection for Sebastian that might be romantic, and I didn't get that very much here, I think because he didn't have very much stage time to develop that relationship. But I did really like the adaptation overall because it focused on the comedy of the crushes of many of the characters and it didn't focus so much on actual serious relationships. It is a little more like a teen or tween experience. People who would like this show are people who like giddy squealing, relatable Shakespeare, and planking on piano benches. I think people should definitely definitely go see this show. 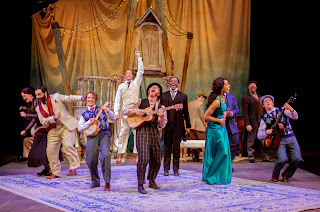 This is one of my favorite Twelfth Nights I have ever seen. When I think of it I still giggle. Once upon a time I went to a show and it was called 42nd Street. The book was by Michael Stewart and Mark Bramble based on the novel by Bradford Ropes. The music was by Harry Warren and the lyrics were by Al Dubin. 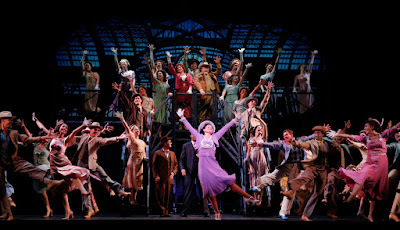 It was directed by Mark Bramble and the musical staging and new choreography were by Randy Skinner. 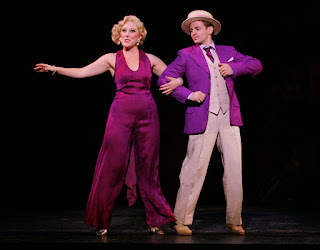 It was about this show called Pretty Lady, which was very over-the-top, and parts of 42nd Street reminded me a lot of Singing in the Rain because there was a lot of behind-the-scenes stuff and the style of the music and the dancing was similar. There was this girl named Peggy Sawyer (Caitlin Ehlinger) and she wants to be in the show as a chorus girl, but it seems like she has missed her chance, but then she gets cast in the chorus because she is too good to pass up and she has the help of Maggie Jones (Britte Steele), Annie (Natalia Lepore Hagan), Phyllis (Mallory Nolting), Lorraine (Vanessa Mitchell), and Andy Lee (Lamont Brown). Also, Billy Lawlor, the tenor in Pretty Lady, is kind of sweet on Peggy. But she sort of likes someone else who is a little less stuck up than he is: Julian Marsh (Matthew J. Taylor), the director, and he likes her back. 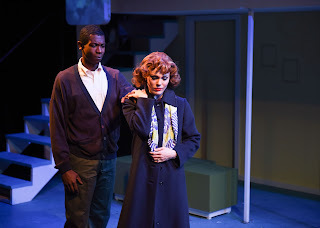 Dorothy Brock (Kaitlin Lawrence) was the lead and during their first performance she hurts herself and can't continue with the process, but she decides to blame Peggy because she think Peggy likes her boyfriend Pat Denning (DJ Canaday), who she shouldn't even have as a boyfriend anyway because she is in a relationship with Abner Dillon (Mark Fishback). 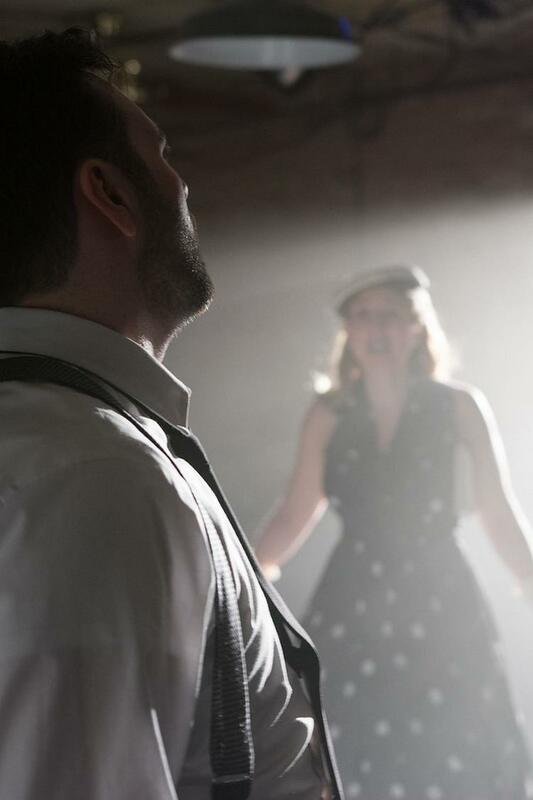 This show is about show biz, how hard it can be and how cutthroat, but also how fun and exciting it can be. I liked this show because it was very exciting and it had a lot of fabulous tap dancing. I really liked the dancing. It was very outgoing, enthusiastic, and a little silly. One of my favorite dances was "Go Into Your Dance." It showed a lot of the actors' talents and the characters' talents. They go to this place called the Gypsy Teakettle and they dance all the way there, which is kind of like me on the street all the time! The waiters are kind of staring at them and then they kind of get into it and they dance over to the table and give them their tea. I also thought it was funny in this scene that Peggy didn't know what a sugar daddy was. She thought it was just a father! Of course, I am 11 and I even know what that is. So that kind of shows how innocent she is. I also loved the dancing in "We're in the Money." They had these outfits (costumes by Roger Kirk) that were made completely out of money, which were fabulous. And they had these huge coins that were boards that they would tap dance on, which I thought was amazing. I thought it was kind of hilarious that no matter what kind of move they were doing, even if they'd done it a bunch of times, the audience would go crazy when they put their hands up in jazz hands. I think that is funny because it is a very simple change in what they were doing, but it seemed like a big deal to the audience. There was a song called "Dames" and one called "Keep Young and Beautiful" and they were both pretty sexist songs. "Dames" was about how gorgeous women are and how there are a lot of different types of dames, but you don't have to remember their names. But I think you should remember their names because even if you are in a slight romantic relationship with somebody you should try to remember their names. Women deserve to be people with names all the time and not something to just be looked at. "Keep Young and Beautiful" was all about how you have to keep young and beautiful for someone to love you. You don't have to be stunning for someone to love you, because looks aren't everything. But the song says you have to be beautiful or you'll never be loved. Women don't have any control over their youth. I think it is a good idea to be healthy, but you can't stay young forever. It is sexist because it is saying that the only important thing about women is their looks and women are responsible for keeping beautiful until they get husbands. This show is about a sexist time and I don't feel like the people who wrote the musical were necessarily sexist. But I still don't like sexism. "With Plenty of Money and You" was a song about how if I was rich and the depression wasn't going on I still wouldn't be happy unless I had you. It was super fun to watch and it was one of my favorite numbers. It was super complicated because all the tap moves were very fast and they also had to keep in time with the music and with each other. If they didn't do that, it would seem a little sloppy, but they did it very well. This song reminds me that the show was set in the Great Depression. 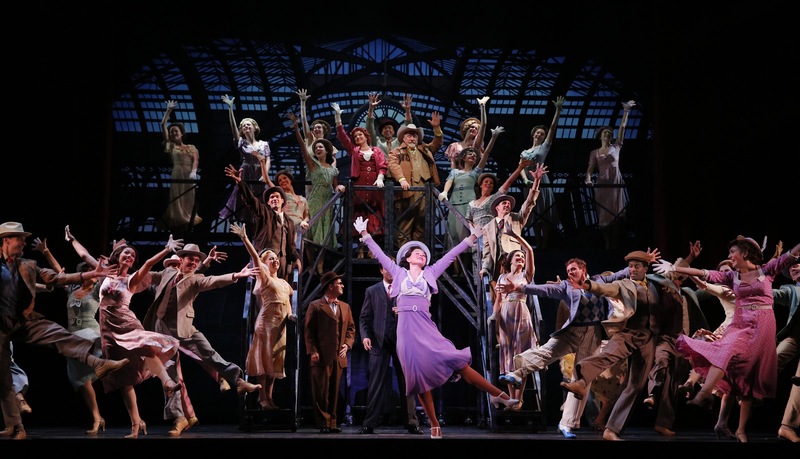 The reason why musicals like Pretty Lady, which are big and overly enthusiastic with almost no plot, were so popular during the depression was because everyone was so sad and they needed to not think about how none of them had much money and their lives were kind of crappy. 42nd Street also lets you get immersed in the story and forget about your troubles! People who would like this show are people who like dames, tap dancing for your tea, and outfits literally made of money. I think people should go see this show. It was super fun to watch and you will tap along with most of the show. I really loved it! Once upon a time I went to a show and it was called The Compass. It was devised and directed by Michael Rohd. It was about this girl named Marjan (Ariana Burks) who was a high schooler and a few years previous an app called Compass was released that would help you make decisions without any of the stress. And she was mad because her teacher Mr. Ferguson (Tim Hopper) wouldn't let her post something on her blog about gun control in her school. So her friend Chaz (Johnathan Nieves) creates a hashtag so that kids will bring in guns to school to show that people can sneak them in and leave them all on the teacher's desk. The audience is part of the jury trying to decide if Marjan is guilty of calling in a bomb threat to the school, even though there wasn't a bomb. An actor comes around and talks to your group and asks you questions about the trial and about what you think is just. After you get more evidence they come around again and you have a different story. I thought that was really fun and new and interesting. It felt very open and exciting, and I really liked that. It was super interesting to be part of the jury because you get to affect the final outcome. You each get your own vote after you have heard the characters' statements. And then each group is asked by their facilitators if they thought Marjan was guilty or not guilty. The final outcome was the one I voted for, which was that Marjan didn't have to go to jail. It was super close, but I am very glad that she was found not guilty. It was also very stressful in the time leading up to the decision because you are wondering if people agree with you or if they disagree with you and what the majority will be. There are some reasons why I like the Compass app they talk about in the play as an idea. But I feel like it really hurt people and they should have put a restriction on it. I like it because it sounds kind of cool to see what celebrities' decisions would be and also what your friends' decisions would be. They should put restrictions on it, though, because people are using it for everyday decision making and they are not being able to make decisions on their own. It is interesting to think about not ever having to make your own decisions. Even though what they say it is is just decision making without the stress, I don't think that it is fully you making the decision. I feel like this show is aimed at tweens and teens because they are using the internet for a lot of things that people never could have imagined would be invented. So a lot of people think kids rely on technology more than adults or that they are not mature enough to make their own decision. I thought this was educational because it helps you practice making decisions under stress with a bunch of other kids around your age. It is also kind of a team-building exercise. It made me think a lot about technology and using technology responsibly. And it gave me a look inside how schools are and the types of restrictions they have, like the restrictions that they have about posting things on the internet. I found it kind of sad how Marjan felt like she couldn't talk to her teachers because none of them would believe her. That is something I kind of had guessed about the way that public schools might be, but I didn't know that you might feel that you couldn't tell a teacher something even if not telling may be threatening to people's lives. The teachers weren't bad, but (and I understand this too) Marjan felt like they weren't going to take her seriously. People who would like this show are people who like interactive theater, futuristic stories, and making your own decisions. I think people should definitely go see this show. It closes tomorrow, so get you tickets today to this really fun and interesting show! Review of Kokandy Productions' Heathers: The Musical. Once upon a time I went to a show and it was called Heathers: The Musical. The book, music and lyrics were by Kevin Murphy and Laurence O'Keefe. It was directed by James Beaudry and the music direction was by Kory Danielson. The choreography was by Sawyer Smith. 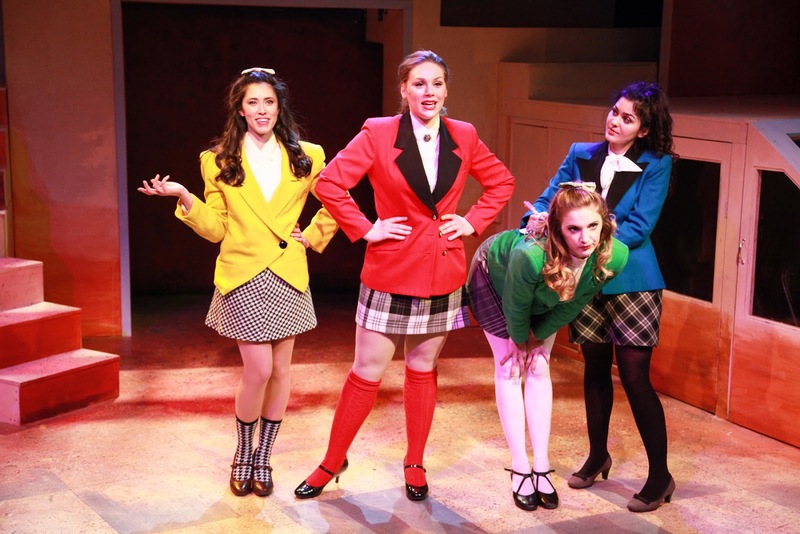 It was about this girl named Veronica (Courtney Mack) and she has just become one of the popular girls, also known as the Heathers: Heather Chandler (Jacquelyne Jones), Heather Duke (Hayley Jane Schafer), and Heather McNamara (Rochelle Therrien). And she gets a boyfriend named J.D. (Chris Ballou) whose dad (Diego Colon) owns a wrecking company, and she finds out that J.D. is a little bit of a psycho but she still likes him, which gets her into some trouble. It is about popularity and realizing that popularity isn't the most important thing. In this show, a lot of characters throw away their lives just to become popular--literally. It is about how important high school feels at the time, but how unimportant it can be in the future--as long as you survive it. I loved this show. I liked the movie already, and I thought the musical made it a lot clearer of a story as well as fun to watch. There is this song called "Candy Store" that all the Heathers sing about how you are really missing out on something in your life if you don't hang out with us. I don't think that is true, personally. I think if you don't hang out with Heather Chandler, you are saving yourself a lot of flipping trouble. They had a very Destiny's-Child-like performance that they did where they were all very in time with each other and did a lot of sassy dance moves. I loved this song. It was one of my favorites. "Beautiful" was a song that Veronica sang and it was about how life could be beautiful if everyone just accepted each other and acted nice to each other like they did when they were younger. "Candy Store," however, is about how popularity is the most important thing and it doesn't matter if you are nice as long as you are popular. I agree more with Veronica's perspective because I think that no matter how popular you are, it won't really matter if people think you are an absolute jerk. I mostly liked the musical better than the movie because I felt like Veronica in the musical seemed a little bit nicer and a little less like she was just a Heather from the beginning. You got to see what Veronica did before she was a Heather. And in the ending of the movie she grabs Heather Duke's scrunchy (that Heather Duke took from the dead Heather Chandler's locker, which is really a nice thing for a friend to do--not!) and puts it on herself. But in the musical she burns it, which I think is more effective because in the movie she is just claiming the power of the popular girl, but in the musical it is more like she is getting rid of the privileges of being popular. It is taking over power still, but it is not saying "Now I'm the popular girl." She is going to use her power not to be the queen bee but to say there shouldn't be a queen bee. I liked some of the things from the movie that they left out, like cow tipping and Kurt face-planting trying to get to Veronica. But other than that I liked the musical much better. It did have "Color me stoked" and "Let's motor" in it, which made me very happy. There was a fun song called "My Dead Gay Son." It could be seen as offensive because they are using a lot of gay stereotypes, but because the people singing it, Ram's Dad (Colon) and Kurt's Dad (Casey Hayes), are actually gay it isn't offensive. I don't think the writers are homophobic, but the characters used to be and I think they are still trying to get over that view of gay people. I felt like Ram (Denzel Tsopnang) and Kurt's (Garrett Lutz) death brought a lot of people together and they realized who they really loved. It is funny and weird and ironic that J.D. and Veronica's lies about Ram and Kurt ended up doing some good. J.D. wants to destroy the high school, but he has brought it back together in this case. I loved the scene when Veronica first meets J.D. and he starts to fight with Ram and Kurt, and Veronica is narrating the entire scene. Her first thought is "Damn!" and her facial expression was hilarious. The fight was overdramatic and made Kurt and Ram look weak and hilarious. It is also all in slow motion which is amazing! I loved that part of the show so much. It was so hilarious. I also love J.D. and Veronica's first "date" where she is in a 7-11 getting Corn Nuts for Heather Chandler and she sees him there and he lets her have a sip of his slushee. "Freeze Your Brain" is about how 7-11 is kind of like J.D. 's home because he is always moving around. The slushee helps him forget about how terrible his life is, but it isn't pleasant the whole time, just like his life. Both of them can change in a second to being painful. "Kindergarten Boyfriend" was my favorite song. 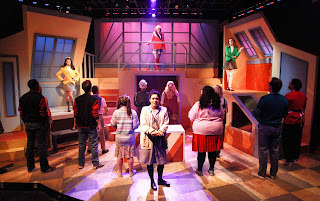 Martha (Teressa LaGamba) sings it about Ram who was her kindergarten boyfriend but then started treating her like crap. I liked it because it was very touching and it was what she thought were her last few moments on earth. I thought it was sad that she was thinking about a person she knew she couldn't be with anymore and hoping she could be with him in another life. I loved the pictures that went along with it that she drew of Ram and her when they were in kindergarten. The song is about how Ram used to like Martha but when they hit high school he was too worried about being cool to spend time with people he used to like. And this song was a lot like "Beautiful" because it is about how life changes and people change in high school. People who would like this show are people who like slow-motion fights, brain-freezing slushees, and popularity scrunchies. I think people should definitely definitely go see this show. I loved it! I had fun the entire time and I felt just really happy afterwards! Once upon a time I went to a show and it was called Far From Heaven. The book was written by Richard Greenberg. The lyrics were by Michael Korie and the music was by Scott Frankel. It was based on the movie by Todd Haynes. It was directed by Rob Lindley with music direction by Chuck Larkin and choreography by William Carlos Angulo. It was about a woman named Cathy (Summer Naomi Smart) and she was married to a man named Frank Whitaker (Brandon Springman) and he turned out to be gay. And after she found that out, her husband still wanted to make it work and stay with her, but the only person that she feels she can talk to is Raymond Deagan (Evan Tyrone Martin) who is their gardener. Then they get to know each other better and she starts to fall in love with him. But the problem is that then her reputation and Raymond's life are being damaged by spending time together because people are racist. They can't see each other anymore because they could both get hurt. I thought this was a touching, romantic, and exciting show. I really liked it. I really liked the scene where Raymond and Cathy talked about art. I felt like it was a scene where you can really see them bonding. They are both appreciators of modern art. Everyone else said the art was "interesting," but I think they thought it was just dumb. Raymond and Cathy seemed to have very different opinions from the rest of the room. They talked about what kind of feelings and images and memories they saw in the picture and how it made them feel. They projected (projection design by Michael Stanfill) each work of art that they saw, and I thought that was very cool. You want to know what they are looking at because there are a lot of different Miró paintings, but the ones that they are looking at in particular really speak to them, so it helps you understand the song. It is a very old fashioned thing to think that Miró, because his paintings are more about feelings and less about accurately portraying what he is seeing, is bad at making art. There are other old-fashioned ideas and ways of thinking in this show, like racism, homophobia, and sexism. Sadly all of these problems aren't yet solved, but I call them old-fashioned because I feel like people should have gotten over believing these things. There is a party that the Whitakers put together and invite everyone from work to. Frank is not very nice in this scene, which is your introduction to the not-so-nice Frank. He says Cathy is ugly when she doesn't have her makeup on. You shouldn't say that about someone, especially in front of their friends. He is insanely drunk and his wife has just found out that he is gay. I think he has gone to drinking to console himself, but that is not the best way to console yourself. He did try therapy, but that didn't work out because his therapist (Jerry Mills) couldn't help him because you can't "cure" being gay and back then they thought of being gay as some kind of disease, which is not at all true. It kind of infuriates me that something that is just the way you feel about another grown-up person is considered an illness. In this scene, you don't like Frank very much, but when he finally makes his decision, you understand. I sympathize with Frank because he is just confused about his feelings. 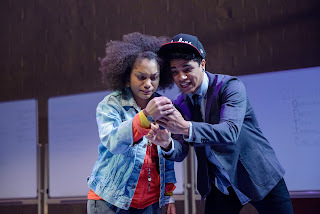 I felt like there should have been more about Raymond and his daughter Sarah (Sidra Henderson) in the play. I really liked how he was very close with his daughter and interacted with her and explained things to her. You could really tell a lot just from Sarah's facial expressions. Like I could see that she didn't want to go play with the boys her father told her to play with, but she did because she wanted her dad to be happy. It would have made the play even better if we had seen the scene where Raymond was talking to Sarah after she had gotten beat up. That would have helped this play seem more culturally sensitive. Without that, it might be seen as another story about some white people not being racist in a world of racist people that doesn't really say much about African American people and their lives. People who would like this show are people who like Miró, forbidden love, and crazy work parties. I think that people should go see this show. It opened my eyes to a lot of things about the beliefs people had in the 1950s, and I really enjoyed it. Once upon a time I went to a show and it was called Question Quest! It was by Zeb Eaton, Sebastian Ffrench, and Peter Stodder. It was written and acted by teens, but they didn't have a director, so everyone made the decisions. It was about Phillip Mayne (Eaton) and he wanted to get his friends back together so they could do this game show called Question Quest! That involves getting Carl (Stodder) out of a coma, Anderson (Menelik Barbarousse) out of a bad-paying job at Starbooks coffee shop, and Fred (Jonathan Young) out of his kingdom of garbage. Question Quest seemed like a pretty normal game show, but their opponents in the game show were not so normal. They were an army veteran (TJ Nakano), an insanely goth person (Nadia Stodder), a boy who had put Carl in a coma (Liam Winchester), and a demon (Eric Edstrom). I thought this was a fun show. It was weird and funny and very creative! Three of my favorite characters were the war veteran, the goth person, and the host Quincy Quistian (Ffrench) because they were really really hilarious. The veteran was very enthusiastic and kind of yelled everything that he said. I found that hilarious; I couldn't stop laughing about that. The goth person would make very "deep" and sad comments. And sometimes they were so dark that they would disturb Quincy Quistian and he would have to say, "Okay. That's good. We're done." Quincy was funny because he got so agitated with his job because it got pretty weird. And when the war veteran would launch into his stories, Quincy would do the same kind of "I don't want to hear that, so let's keep going!" He would say something along the lines of,"I don't want to hear that" in a very serious way and then go back into gameshow-host mode for "So let's keep going!" I thought that was very funny. At the end, their prize was getting to go to a water park, which was their favorite thing to do. But it ended up just being a giant kiddie pool. How excited they were about the kind of dumb water park was very funny without being super complicated. All of the humor was not super complex, but it was super enjoyable and I did laugh a lot. There was a long moment of just the squeaking of the kiddie pool being taken onstage, and that built hilarious suspense. And then the lights come up and there is the kiddie pool there, and they are all sitting in it. They had been building up suspense about how great this water park is, but then once all the suspense was built up and it was time to be revealed you learn that it is just a kiddie pool with really cheap tickets. But they are so excited about it even when they are there. They make a huge deal about it and I found that very funny. There was a garbage kingdom where everybody was made of garbage. They placed garbage all over their bodies and covered the stage with garbage. I thought it was funny how there were people running around with garbage all over them and garbage all around them. This entire show was basically a festival of absurdity. They don't just find their friend Fred in a garbage dump, they find him in a garbage kingdom where he has become the king. It felt like an idea that you really only think of in a group and then you make it into a whole storyline with your friends because you all find it funny, like a drawn-out inside joke. It wasn't obscure to me though; I could still understand and enjoy it. People who would like this show are people who like kiddie-pool water parks, garbage kingdoms, and enthusiastic war veterans. I really liked this show, but sadly it had a very short run and is closed now. I still wanted to review it because I thought it was very fun and I'm looking forward to what this company does next.